We would describe our music as: It’s a bit difficult to describe what we do… most of our songs are written and arranged by Julie, and they are “unpigeonholeable” I suppose. Beautiful folky melodies with funky, bluesy jazzy, punk and rock’n’ roll sensibilities I suppose! We play some pretty obscure covers too! Background Information: The Cherry Pinks gradually formed over the Summer of 2018. 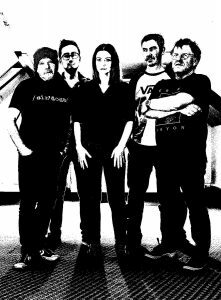 The five-piece band is made up of members who all also play in other bands including The Mind Sweepers, Poison Ivy League and Josephine and the Shades. Julie Ward is at the heart of the band, writing and arranging all of the songs, as well as performing as vocals and guitar. Despite only forming a short time ago, they have already played a gig at the Coach and Horses in Dumfries, appeared at the Dumfries Music Conference, and have some January gigs planned at the Big Burns Supper Hub, as well as a return to the Coach and Horses. Small Town Sounds spoke to drummer Neil Paterson about the band recently – you can read what he had to say here – ‘Introducing…The Cherry Pinks’. Like The Cherry Pinks on Facebook here.